Growing up with horses from a very young age, Gabrielle Baker knew that the career path she wanted would involve her passion for horses. She became interested in the Equine Business Management program at Cazenovia College because of the business aspect of the program, which allowed her to follow her passion and prepare to follow her dreams of opening her own barn. "I grew up only an hour away from Cazenovia and I knew about the College, but never looked into attending until my junior year," comments Baker. "The first time I visited campus was for the Equine Open House, and I immediately fell in love. I really liked the small community feeling and how easy it was to find my way around campus. I knew I could definitely make Cazenovia College home for the next four years!" Baker shares how welcomed she felt by the Admissions staff, especially Associate Director of Admissions Brett Carguello, who is the school's equine program liaison. "Brett was fantastic! He contacted me personally and made me feel like the College really cared about their students, and wanted me to be part of the College family. He had a huge impact on my decision to come to Cazenovia College," she adds. With a mixture of equine courses that allow students to gain hands-on learning in the College's Equine Education Center and business management courses that teach students the complexities of the business, there are ample paths that graduates take after graduation. Some of the courses that Baker credits most with preparing her for her dream are the accounting and business management courses. In Advanced Business Management, Baker completed an 80-page business plan that she has held onto in anticipation that it will help her start her own farm one day. Another course that she learned a lot from was Equine Disease and Injury, where students learn about a variety of symptoms and how to prevent and treat injuries. 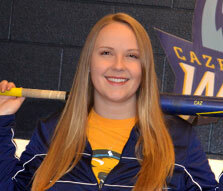 Baker credits having such a positive experience at Cazenovia College to her professors over the years. She says, "Professors Barb Lindberg, Carol Buckhout, and Amy Sherrick-von Schiller have had a major impact on me. I have gone to them all with questions or issues, and they are always there to help me in determining the best way to handle the situation." On top of being a full-time student, Baker is a student-athlete on the College's nationally ranked equestrian team. She currently rides Hunt Seat, but has competed in the Western and Dressage disciplines as well. Baker shares, "It is nice to be able to come to Cazenovia College and have the experience to ride disciplines that you never have before. The coaches are welcoming when it comes to sharing their knowledge, and encourage the team to learn something new." During her time on the Cazenovia College's Equestrian Team, Baker qualified for the nationals open flat, individual class in 2017. She prepared for weeks with the coaches, and was supported by her teammates. In the summer of 2017, Baker was also chosen to represent Team USA in Bern, Switzerland, with two other Cazenovia College classmates. Baker shares, "Sherrick-von Schiller suggested that we apply to the international student riding competition, which is open to college students across the US. Three of us made the team, including Savannah Mannes, Erica Ferreira, and myself." Competing against fourteen countries in the Student Rider Nation's Cup (SRNC) in Switzerland, the Wildcat trio and Team USA captured the Silver Medal (2nd Place) in Show Jumping, while finishing 13th in Dressage. Their efforts gave Team USA a 7th place finish overall. Baker also finished 3rd individually in Show Jumping and 12th overall. Baker shares, "It was amazing to go over to Europe and experience a different culture, while still being able to ride and do something I love." Another one of Baker's favorite experiences while she has been a student at Cazenovia College was interning at the stable owned by John and Beezie Madden. She comments, "Beezie is a two-time Olympic gold medalist, along with a bunch of other accolades, whom I have idolized and watched ride since I was a little kid. So it was a wonderful experience to intern with her, I took away many things that have allowed me to grow into a young equine professional." From the internship experience, Baker landed a part-time job at the Madden's farm during her senior year. She spends 15-30 hours a week working at the farm and learning from Cazenovia's "hometown hero." When asked what advice she would give to future Cazenovia College students, Baker comments, "Everything is what you make of it. You are the one who decides what type of experience you are going to have, and it is important to go into everything with an open mind and positive outlook." Baker continues, "My Caz Experience is definitely an experience I will always look back on and have positive memories from, because of all of the things I was involved in."